With respect and love, twelve of the most talented writers working in young adult literature today —an impressive sisterhood that includes Marieke Nijkamp, Meg Medina, and Anna-Marie McLemore — have created a century and a half of heroines on the margins and in the intersections, young women of all colors and creeds standing up for themselves and their beliefs. They are ignoring their mothers’ wellmeant advice and forging their own paths — whether secretly learning Hebrew in early Savannah, using the family magic to pass as white in 1920s Hollywood, or singing in a feminist punk band in 1980s Boston. And they’re asking you to join them. Autographed copies are available through One More Page Books. Click here to pre-order! ★ These are tales across time and cultures, offering diverse women as witnesses to historical times. Contributor Dhonielle Clayton sums up the necessity of such an anthology when she writes, “There are few stories about what nonwhite people endured [during World War II], and I wanted to explore that.” A needed collection to broaden understanding of the many different faces of history. This collection is extremely informative, intersectional, and inspirational, and will be sure to spark dialogue. VERDICT Recommended for all young adult collections. 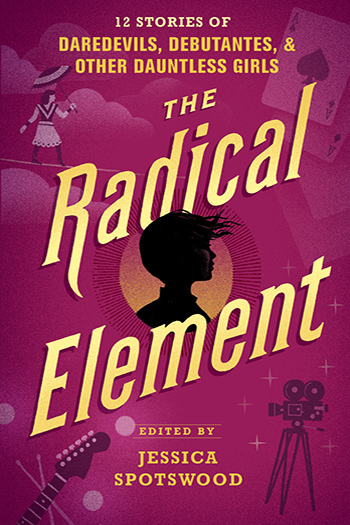 Anna-Marie McLemore, Meg Medina, Dahlia Adler, Dhonielle Clayton, Sarvenaz Tash, Sara Farizan, Marieke Nijkamp, Erin Bowman, Stacey Lee, and Mackenzi Lee each tell a story of young female resistance and revolution in history. It’s super timely and empowering, this is one you’ll want to carry around in your tote bag. Perhaps this intriguing collection will encourage girls to embrace their best selves and to engage in radical actions of their own.